Use the Error Parsers properties tab to customize the list of parsers that detect error messages in the build output log. Error Parsers Lists all of the error parsers currently known to CDT. 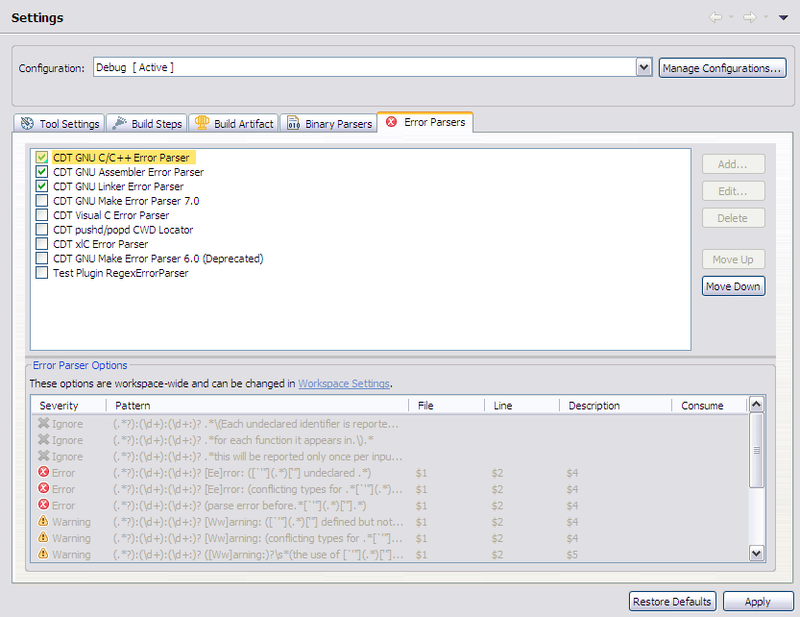 Select the parsers that you want to use, and select the corresponding line to edit parser's options, if required. Add... Add an error parsers to the list. Edit... Edit the current error parser in the list. Delete Delete the selected error parser in the list. Move Up Moves the selected parser higher in list. Note: The order matters for selected parsers only: they are applied to error logs in the same sequence as defined by the user. The order is not preserved for unchecked parsers, so you do not have to move them. Move Down Move the selected parser lower in list. Note: The order matters for selected parsers only: they are applied to error logs in the same sequence as defined by the user. The order is not preserved for unchecked parsers, so you do not have to move them.